years on the committee and three as Chairman. Secretaries shield competition in 2013 losing only to the eventual winners and putting up the best performance of any of their opponents. 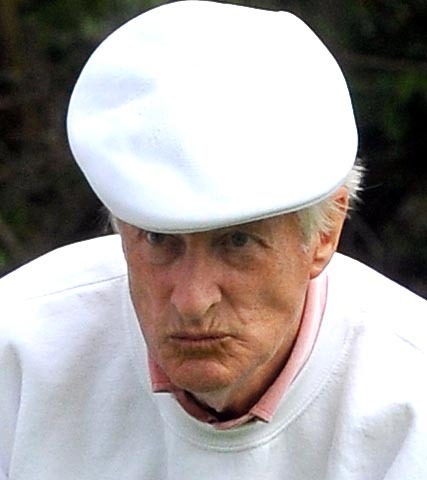 We are not losing Chris as he will stay on the Golf Croquet sub-committee which he will fit in around his other tasks as Chairman of the Southern Federation and Editor of the Croquet Gazette. The big news this year is of course that we are going to have winter play starting in January and running through to the end of March. It is largely through Chris’s determination not to take ‘No’ for an answer that we are now starting winter play in 2014. If this proves to be a success we can look forward to more years of winter play so be kind to the lawns. We have only asked for two lawns to be available for winter play as an experiment but I see that the groundstaff are mowing all four lawns. The committee will decide in early January whether to use two or four. The winter use of a lawn makes the lawn faster (and more challenging) in summer and therefore we wanted to experiment a little this year. We hope we will be able to start by 11th January but this is subject to weather conditions allowing the lawns to be prepared. See the separate sheet for the winter rules. I am giving a bottle of wine to the first person who scores two hoops with one stroke in a game during winter play. 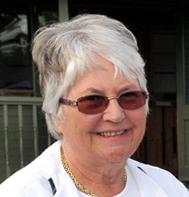 Frances Colman is again heading up the GC committee and we can look forward to another year of excitement with both the usual season long competitions and the day or weekend tournaments. We may even squeeze in a winter tournament one weekend. 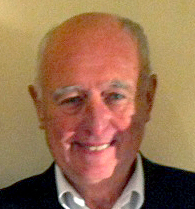 Brian Bucknall continues to head up the AC committee and we will have the usual programme of training and competitions. We look forward to as many members as possible taking the training course. I would like to wish all our teams, both GC and AC every success in the inter-club competitions and also all the individuals who take part in tournaments and events away from the Club. Last year we had the notable successes of Ian Norris winning the National Golf Croquet B-Level Trophy and Frances Colman triumphing in the Greek Open at Corfu so keeping the trophy at Phyllis Court for the third year running. We have arranged for a consultant to assess the lawns and a report has gone to Graham Owen which I hope will help in the management of the lawns in the future. We have a full complement of mallets and, as required, we are buying new balls. As usual may I ask that you please enter the lawns by the entrance and steps provided. Last year we had a series of excellent social events including a wonderful river cruise all under the guidance of Ann Norman who is going for an encore this year. The first event is the winter lunch which is on 28th January with a pre-season meeting at 11.00am followed by lunch at 12.30. Please book your lunch at Reception. The pre-season drinks will be held on 19th March. We also have a small library upstairs at Phyllis Court where you can find among other things copies of the Croquet Gazette. 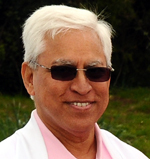 Raghu Iyer will be sending out the usual notices and updating the membership list. Please ensure that your name is on the membership list with the information you want to be shown. Just a reminder that apart from the website, information about what is on will be on the notice boards in the Pavilion and in the Clubhouse. We will also endeavour to keep you all up to date by e-mail or letter. 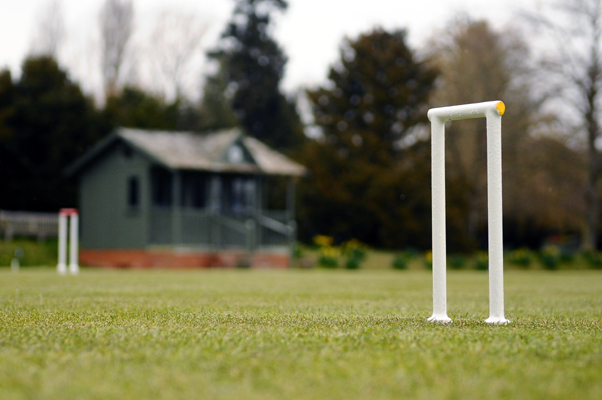 I hope you all have a very enjoyable year of croquet during 2014. Entry forms for all our 'season-long competitions were sent-out today and the big news is the announcement of a NEW EVENT for 2014. 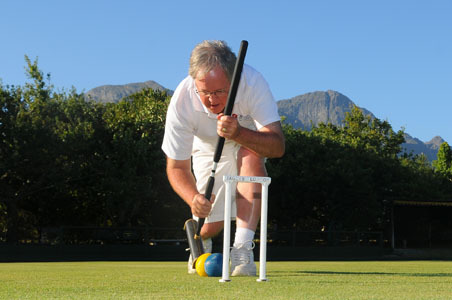 "The Handicap Singles competition levels the playing field because the higher handicapped player get extra turns to use. This gives the underdog a lot more bite!" If Anne Attfield (with her handicap of 8) plays against Mike Fensome (handicap 2) - Anne will get 6 extra turns in each of her games. Or if Joanna Iyer (with her handicap of 11) plays against Chris Roberts (handicap 0) - Joanna will get 11 extra turns in each of her games! "I hope that you will support this NEW competition which will be lots of fun!" 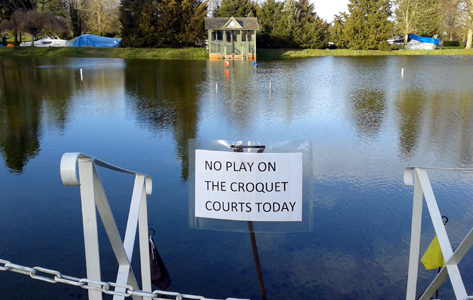 Harry Midgley reports "If you have seen the croquet lawns recently you will appreciate that commencement of winter play is going to be delayed. The height of the river has inundated Courts 3 and 4 to a depth of several inches. Also the rains of the last few days have left standing water on Courts 1 and 2. In any event it is unlikely that play will be available in the next two weeks and possibly not before the end of the month". Today Chariman Harry, GC Organiser Frances and helping hand Chris, laid out the hoops on courts 1 & 2 in preparation for the start of Winter Play. They have been set wider that usual to keep everyone moving along! The grass will need mowing a couple of times before we can play and our groundstaff should be getting on with that this week. If you want to book a double banked game on a court which already has a game booked, the computer system won't allow you to add in your game yourself. 1. Just turn up and see the 'number one booker' personally. 2. Contact the 'number one booker' and ask them to add you on as 'players 3 & 4'. 3. Contact Reception and ask them to do likewise. Today about 50 members attended this now traditional gathering and heard Chairman Harry explain the special arrangements for Winter Play. Frances Colman outlined the GC season ahead and was pleased to report that all Tournament and Match Fixture dates for GC have been finalized and these were displayed for members. Frances will be sending this out to all members in the next few days. The AC arrangements are still to be announced by Brian Bucknall. Chris Roberts ran through this website and updated members on the court booking system before everyone enjoyed our Winter Lunch. 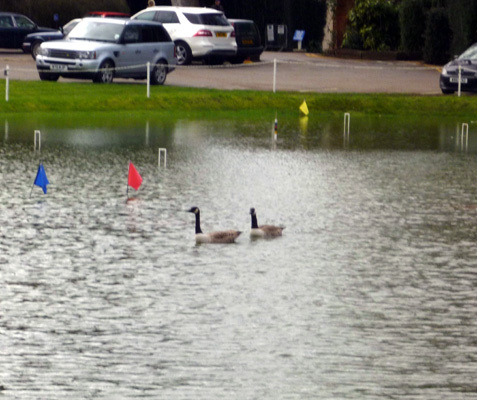 9th February - At least the geese are happy! 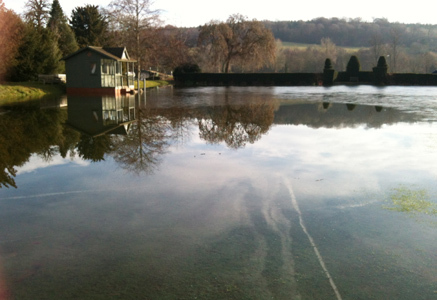 Chairman Harry took this picture (left) of our flooded courts. This is the first time for many a year that all four courts have been submerged. Is there no end to this rain? Eight PCC players ventured to Ealing for a first ever friendly fixture with the West London Club. A handful of our players have recently joined Ealing whislt reatining their membership at PCC. One such is Don Rutherford, who was our host for the day where we played four doubles games each, both against and 'with' the Ealing players. The super-fast courts caught us out at first but soon enough everyone was enjoying getting back into the swing of things. All four courts were completely submerged by the risen Thames water table today as Robin Morrell's photo (right) shows. Does anyone know hen this last happened? Phew, what a scorcher for South African pair! Frances Colman and Chris Roberts 'warmed-up' for our new season with a trip to South Africa along with pal Richard Stevens from Hamptworth. Even the thinking process was a challenge on the hottest of hot days when temperatures rose to 42 degrees on court. 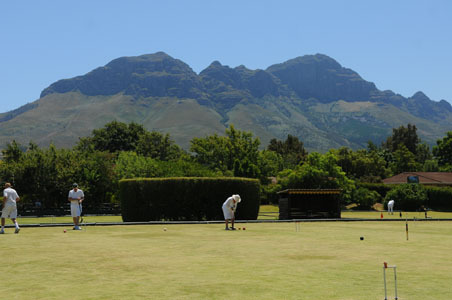 Both players won more than they lost during the week long event at Somerset West, near Cape Town. Two days ago, 16 players enjoyed the first proper GC all comers session following the recent floods. They were warmed on their way by the provision of mulled wine before enjoying courts that are playing much better than might have been imagined after all the waterlogging (photos by Chairman Harry). 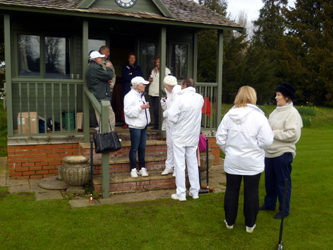 A similar number attended yesterday, proving that winter play is indeed a hit at PCC. AC has been played by three members this week too and the courts, though heavy, are perfectly playable in either code. Do 'come on down' and join in with the scheduled sessions or book a court of your own at any other time. 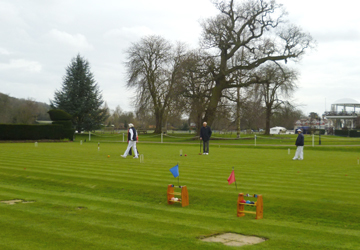 Four PCC players (From left to right above) Raghu Iyer, Pauline Wood, Ralph Chambers and Paul Kerry attended Cliff Jones's single day laws course, organised by the Southern Croquet Federation, at Hamptworth this week, in preparation for the season ahead. The day before, Mike Fensome attended the SCF's single day GC Improvers Course which was fully subscribed with 23 others in attendance. Mike will be an even more 'Fearsome Fensome' this season now!